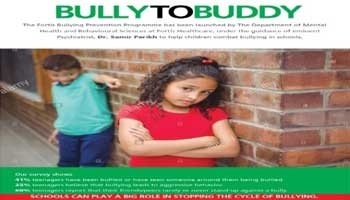 The problem of Bullying is rampant and in order to provide an effective and efficacious method for tackling this problem, the Bully-to-Buddy campaign was launched in 2016. The campaign provided for support to schools for creating a system of managing bullying, developing rules and reporting systems for it and empowering students to be able to say a "NO" along with the creation of Anti-Bullying Squads. We conducted 28 workshops in 22 schools empowering 3550 students in 4 cities to say "NO" to bullying.